Here is what MBUK had to say about the New Magicshine Eagle m2 "The Eagle M2 is a new unit from Far Eastern lighting specialist Magicshine. It uses a two-row LED arrangement with three lower floods and three upper spots. The bulky three-button wireless remote looks a bit like a child's toy, but succeeds in letting you select either row or both simultaneously. You can also toggle through five different power levels for each mode, all without taking your hands off the bar. 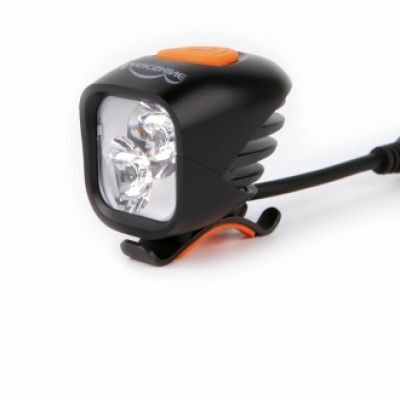 With a maximum output of 2,400 lumens, the Eagle M2 is a seriously bright light when you need it to be, a wide spread/short reach light for climbing or a narrow spread/long reach light for fireroad blasting. The head unit detaches easily from the stable, semi-permanent bar clamp and the hard case battery has twin rubber straps for security plus a Velcro strap to keep the cable tidy. Magicshine reliability has always been good too." Magicshine Have stepped there game up yet again expanding the eagle range of lights to the new Magicshine Eagle M2. The little brother to the new Eagle F3 however this one is slightly cheaper, weighs only 127grams and is not quite as bright. It uses 6 CREE XP G2 Chip LED'S to produce an amazing 2400 lumens with a fantastic Beam Pattern that doesn't have any dark spots! 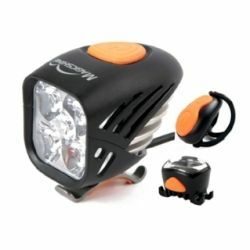 Magicshine have made a really versatile light that has 3 different modes. 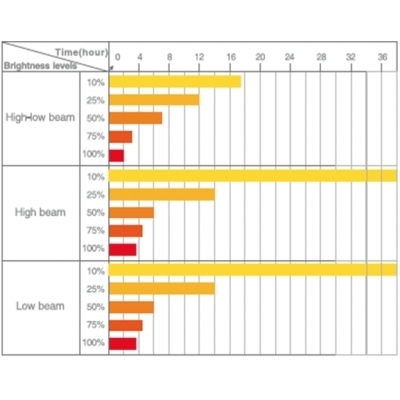 The top three LED'S can be powered and produce a spot beam that is perfect for anyone doing a commute on dark country roads. Or you can put the bottom 3 LED'S on to produce an unltra wide flood Beam. Or if you really want to turn Night in to day you can all 6 on to produce 2400 Actual Lumens with a great beam spread. As standard this package comes with a 4400 mAh Battery give you a 2 hour run time on full power with all six LED'S running. You can take a look at the picture above to see the different run times for all the different settings. 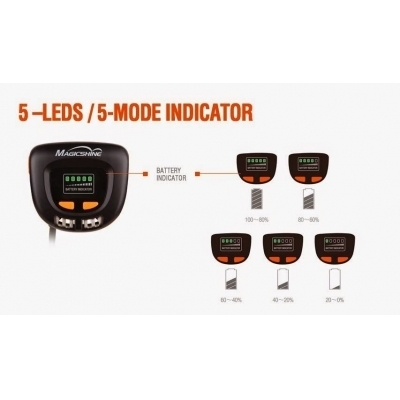 Please Note this is an updated connection from magicshine so existing batteries are not compatible. 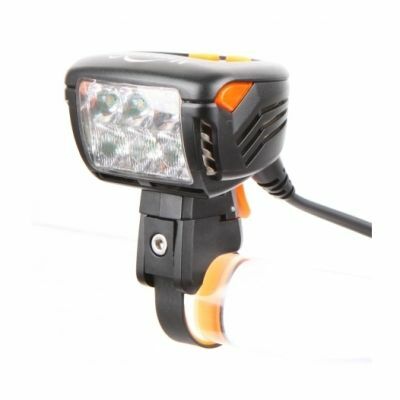 Similar to the eagle 600 this uses a fixed mounting clamp system that can be left on your bike while to clip the light unit in or out. A really simple and effective mounting system from magicshine. 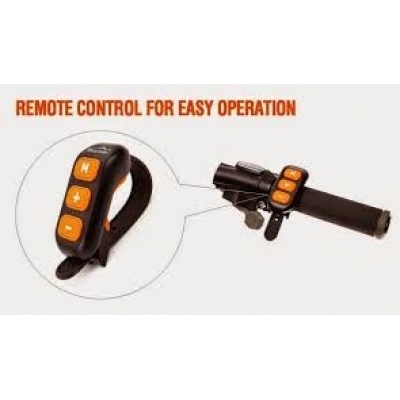 This Unit also comes with the new wireless remote from magicshine that allows you to alter change the mode and power levels of the light without having to move your hands away from the handle bars another great feature. 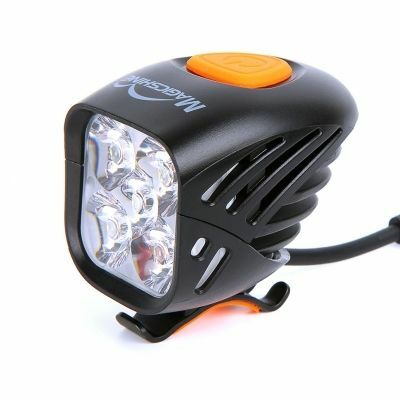 You can see Why MBUK have just given this light 4.5 stars out of 5 for £87.98 this really is a game changer.